Phuket has long been a Mecca for nightlife entertainment. 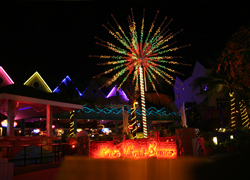 During the past twenty years, one of the main reasons for visiting the island was to enjoy its unique nightlife treats. Times have changed on the island and a more wholesome approach to the nightlife scene has been emerging over the past five years. From girlie bars and go-go dancing clubs, to live music venues, discotheques and Irish Bars, Phuket has it all. Bang Tao has the reputation of being a peaceful beachside destination, but there is more than meets the eye in regards to this sleepy area if you dare to look. 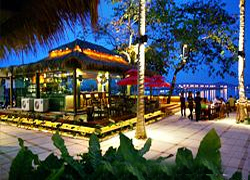 A great place to enjoy a quiet drink in Bang Tao is the cluster of beach bars that include the Reggae Bar and Sky Bar. There is probably not a more relaxed place in Phuket. Another excellent beachfront drinking option is the Orange House. This colourful restaurant and bar is a nice place to sample a drink or two in a chilled out atmosphere, or partake in a couple of frames on the pool table. If you are needing a bit of excitement but Patong seems too far away, you could visit the Tinlay Palace, which is a cluster of beer bars situated near the entrance of the Laguna resort. The hip and cool crowd at Bang Tao prefer to visit the Siam Supper Club, which is a trendy lounge bar with a relaxed atmosphere. 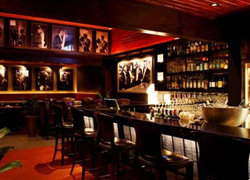 Enjoy their soothing Jazz and lounge music while devouring the wine list and a host of top-notch cuisine. Chalong wouldn’t perhaps be the first port of call for partygoers, but surprisingly enough, there are lots of nightlife entertainment options to enjoy. 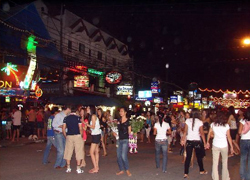 Most of the nightlife scene centres around the Chalong Pier area of the region. Here you find a heady mix of restaurants, girlie and beer bars and some beachside bars thrown in for good measure. On the beach road within close proximity to Chalong Pier, there are a few longstanding bars that enjoy the scenic sea-views and a warm atmosphere. Such bars include the Tamarind Bar and The Lighthouse (formerly Jimmy’s Lighthouse), both of which have become favourites with divers and expatriates. On the road leading to Chalong Pier, the Beer Garden has become a favourite joint for those who seek out televised sporting events with sea-views. The Beer Garden is inexpensive and serves choice draft beers in a friendly environment. Also on the road to Chalong Pier, you could visit the Happy Days Bar, which is run by a young English guy. This is where most of the younger expats hang out and is the ideal place to meet new and interesting people. Although considerably smaller and quieter than Patong, Karon Beach has a nice selection of bars and nightlife options with a more laidback yet still vibrant atmosphere. There is a balanced selection of beer bars and girlie bars situated in Karon. 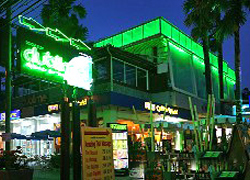 The two main nightlife areas in Karon are Karon Centre and Luang Pho Chuan Road. The main landmark at Karon is the roundabout, and when taking the Patak Road turnoff, you will find Karon Centre on your left hand side. This is Karon’s main area for nightlife entertainment. Soi Islandia is the street where everything happens in Karon, and here you will find a host of beer bars aimed towards those who enjoy a spot of nightlife entertainment. 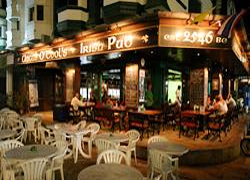 The most famous bar and hangout spot in Karon is undoubtedly Angus O’Tools’s Irish Pub on Soi Islandia. Here you can enjoy a friendly atmosphere with draft beers, air-conditioning and two large screens that are devoted to live sporting events. During the week, they provide live music, but the weekend is dedicated to Premiership Football, F1 and Rugby upon the large screens. The owners, Maurice and John, are very friendly and always on hand to provide you with their inside knowledge of the Phuket tourist scene. This bar is a great place to meet likeminded individuals. On the corner of Soi Islander, you will find a small complex of girlie bars, which can be an interesting night out if you don’t mind earth-shattering high volume levels or constant harassment from the girls who work in the bars such as Football Crazy and Clapton’s. Hilarity aside, these bars can be quite fun if you interact with the girls and fellow customers. Some of the most popular bars in Karon Centre include the Skylight 2 Bar, the No Name Bar and Angus O’Tools. Karon is relatively small when compared to Patong and doesn’t own any nightclubs and discotheques, but if you stay around the Soi Islandia area, there are plenty of bars that open until 2am in the morning. Luang Pho Chuan Road can be accessed from Patak Road or the Beach Road between Karon and Kata. Here you will find an eclectic mix of beer bars, restaurants and girlie bars. Favourite bars and entertainment areas on Luang Pho Chuan Road include the Karma Lounge, Bangla Plaza and the small and unpretentious Bar Soi. 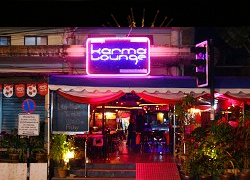 The Karma Lounge is a funky little bar that plays laidback tunes and is sometimes home to a sprinkling of live music. This is a great place for couples and those looking to get away from the hectic nightlife scene that Phuket is famous for. Bangla Plaza and Bar Soi are similar to each other, although Bar Soi is much smaller than the plaza. Here you will find the hectic and electric atmosphere of the girlie bars you will find in most tourist regions on the island. If you are looking for a wild night out, you should visit these places. Kamala is situated north of Patong on the west coast of the island, and that is where its similarity ends. 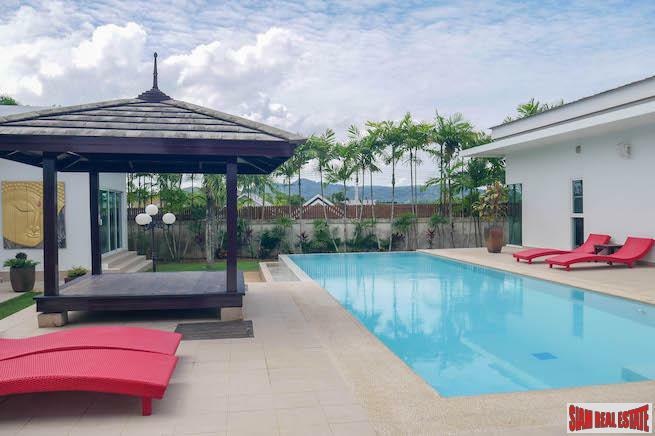 Although the village has expanded in a nightlife sense in recent times, Kamala is better known for its Lawn Bowling Green and Phuket Fantasea Park than its nightlife scene. Kamala is mainly home to restaurant bars such as Kamala Mountain View, The Club and Rockfish, where you can enjoy a quiet drink and enjoy the sea-views. 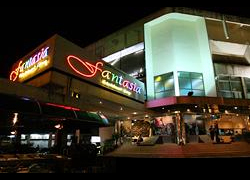 There is however, a cluster of beer and girlie bars positioned on both sides of the main road that runs through the village towards Phuket Fantasea. The beach road is where you will find some warm and friendly bars such as the Kamala Beer Garden, which is home to pool tables, big TV screens featuring major sporting events, and cold draft beer on tap. Here you will meet some interesting expatriates and tourists out to enjoy themselves in the peaceful Kamala area. You can find the busy area of Kata Central by following the Beach Road from Karon. 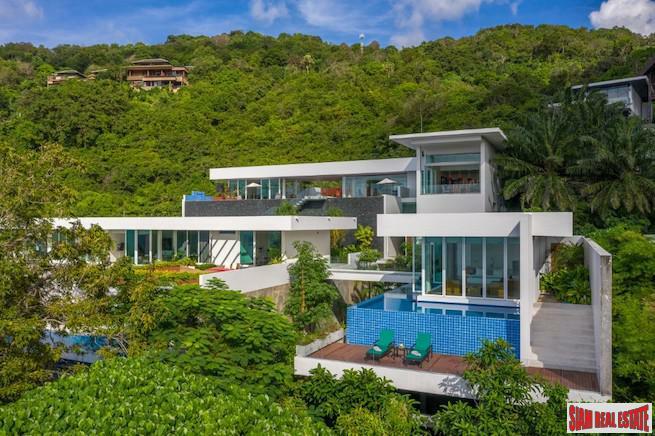 Just after Karon Football Stadium, you will begin your ascent up the hill towards the Dino Park Mini Golf Park, and from there to the Club Med Resort is known as Kata Central. Within this relatively small area, you will find a concentration of bars and restaurants that are only matched by Patong. 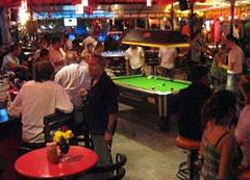 The mix of bars in Kata Central is generally tourist friendly establishments that serve beer for cheap prices, many of which also own pool tables. These standard beers bars such as the Solution Lounge Bar are great places for couples looking for a friendly place to enjoy a drink and company. 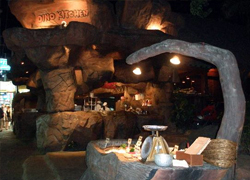 Situated behind the Club Med Resort at Kata Beach, you will find Kata Night Bazaar. Within the bazaar and on the surrounding road, you will basically encounter a cluster of girlie bars, which is an action packed area that is enjoyed by many tourists visiting the region. Within the bazaar itself, you will find a dominating water feature/pool as the focal point, which is surrounded by several neon-lit girlie bars. On further inspection of the Night Bazaar, you will also find a selection of bars and clubs that includes the Australian Bar & Grill with its draft Fosters and pool table. Flamingo’s Splash Lounge Bar is also a great place for couples and groups of friends to enjoy a drink. Flamingos also provide live music sometimes, where Ricky Zen has been known to perform his quality brand of rock. This part of Kata is situated at the southern end of Kata Beach and is sometimes referred to as Kata Village. On Kata Road between the bazaar and Kata Village, you will find Arfur O’Tool’s Irish Pub, which is affiliated to the original Angus O’Tool’s in Karon. If you are looking for a warm and friendly atmosphere with imported draft beers, this will be your home from home. Further towards South Kata, the area becomes more built up with hundreds of restaurants and bars to enjoy. This is a family-orientated area with minimal girlie bars and a more wholesome selection of nightlife entertainment. 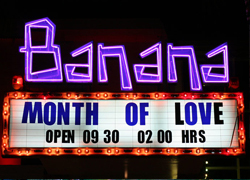 Banana Disco is one of Phuket’s longest running nightclubs, although its popularity has took a nosedive since some of the newer nightclubs opened on Bangla Road over the past five years. This club is still worth a visit, and is situated on Patong Beach Road, enjoying a selection of dance and hip-hop music courtesy of live DJs. If you like funky house music, international DJs and a chic and happening discotheque, Club Lime must be visited. This nightclub is similar to what you would find in most European cities. With its neon-lit bar and its comfortable chill-out zones, Club Lime is home to the beautiful people in Phuket. Highly recommended for dance music lovers. This is one of the newest nightclubs on the island and has quickly become ‘the place to be’. Many people visit Hollywood in the early hours of the morning when the main bars on Bangla Road have closed for the night. This European style nightclub enjoys international DJs spinning dance, R&B and hip-hop tunes until early in the morning. 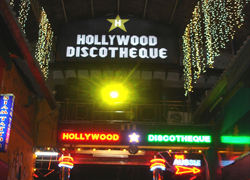 Situated directly on Bangla Road above Soi Easy, this is a must visit club for party people. 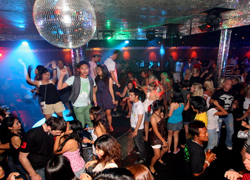 One of the most famous dance clubs in Phuket is Seduction, situated on Bangla Road. If you like European dance music expertly mixed by International DJs in an electric atmosphere, make Seduction your first port of call. Situated on the grounds of the Jungceylon Shopping Complex, Sound Phuket is the island’s trendiest and newest nightclub. From the chic illuminated interior to the International DJs spinning the most popular dance and chart music from the western world, Sound Phuket is ideal for lovers of European style nightclubs. Tai Pan is more than just a nightclub with DJs spinning the latest pop and dance tunes, as it is also a live music venue earlier in the evening. This is a great place to visit with your wife/husband, enjoy the live music and then watch the atmosphere change around 11pm into a full-blown discotheque. This is one of Phuket’s most loved and longest running entertainment venues, situated directly opposite from Bangla Road on Rat-U-Thit Road. 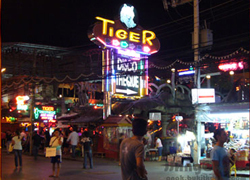 Situated on Bangla Road above the Soi Tiger entertainment complex, Tiger Disco is a favourite amongst tourists and partygoers. This large nightclub might not be the classiest establishment in Patong, but it is most certainly one of the most action packed. Enjoy live DJs spinning a choice selection of dance and pop until the early hours of the morning. Being the home of Phuket’s nightlife entertainment, Patong offers a vast selection of bars and live music venues to suit all tastes. 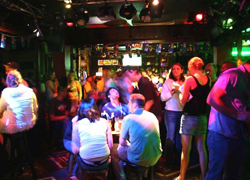 Irish Bars personify the wholesome nightlife options in Patong. By visiting Irish Pubs such as Scruffy Murphy’s, Molly Malone’s, Irish Times and Finnegan’s Wake, you can enjoy draft beers, air-conditioned surroundings, vibrant atmospheres and live music all under one roof. If you are a fan of live rock music, then Rock City, situated opposite Bangla Road next door to Tai Pan, is the best venue for you. Musicians from all over the world perform in tribute bands and play a selection of live rock classics to a very high standard. If you enjoy a beer while people watching, bars such as the U2 Bar on Bangla Road will be your ticket to ride. Whilst the bars are always heaving and own great atmospheres, they are perfect for watching Bangla Road unfold right before your eyes. For travellers wishing to experience some real Thai nightlife, as opposed to the commercialized tourist areas, Phuket Town (City) is the place to go. At first glimpse, the town seems devoid of any real interesting nightlife entertainment, but that is simply untrue. From Irish Bars and trendy wine bars, to discotheques and live music venues, Phuket Town is more diverse than some would imagine. On Montree Road, near Central Bus Station, you will find O'Malley's Irish Lounge Bar. This is the ideal starting venue for a night out in the town within a friendly atmosphere serving draft beers. 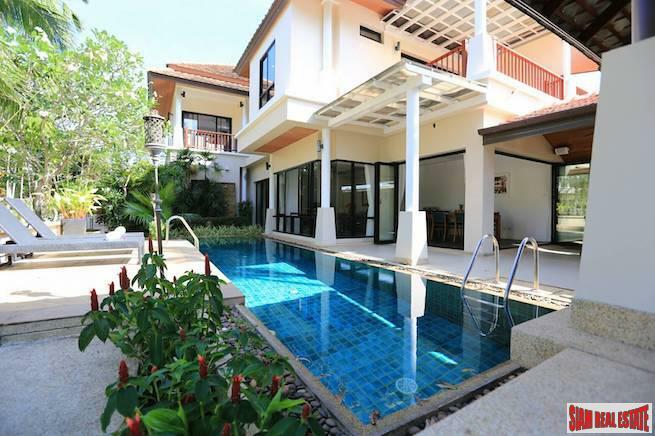 Surin is more known for its high-end property than its nightlife scene. This peaceful yet colourful region enjoys a laidback scene that suits couples and families more than partygoers. If you enjoy relaxing the night away beachside, the Catch Beach Club is easily the best option. You can sit with the sand between your toes and listen to a sprinkling of live music on chosen nights while enjoying a great wine menu within the trendy décor. You can even check out the Catch Beach Club live webcam to get a feel for the location. Other well-known and popular bars in Surin include the Liquid Lounge, the ever-friendly Diver’s and the Sports Bar at the Surin Bay Inn with its great English food and warm atmosphere. If you are looking for something a little more up-market, we suggest you sample the classy fare at the Envision Wine Bar. 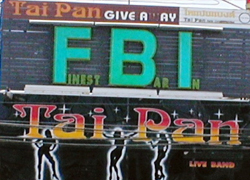 Outside of Patong, nightclubs are a rare commodity. 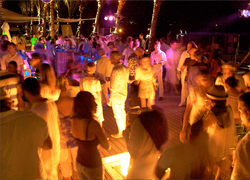 However, Surin Beach is home to one of Phuket’s finest nightclubs, named the Stereo Lab. This fresh and funky lounge bar and nightclub has become one of the coolest hangout spots in Phuket. Live DJs perform every night of the week, spinning funky house music, chill out tunes, electro, hip-hop and R & B. 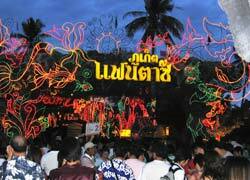 The location is situated on Surin Beach and is a must visit for the happening crowd, especially on Friday nights. 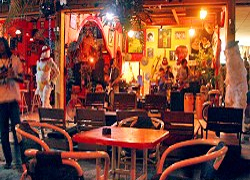 Opposite Nai Harn Lake, you will find the Yoonique Stone Music Café, which has gained quite a cult status with the younger people and music lovers within the expat community. The rustic and funky décor alongside the warm and friendly customers makes this bar a great place to make new friends and learn some local knowledge from people who live in Phuket. Yooniques also hold regular jam sessions on Tuesday nights, as well as art shows from local talent and the odd live music performance. Beside Yooniques, you will find the local Reggae bar (every tourist area has one), which is filled with Thai Rastas and the obligatory Bob Marley ensembles. Although Rawai seems to appear a sleepy sort of fishing village, the beach road after sunset provides a decent assortment of nightlife options. Nikita’s Bar & Restaurant is a pleasant environment to enjoy a peaceful drink with family and friends. This well established bar is positioned directly on Rawai Beach and is a great place to meet expatriates that reside in the area. Directly across the road from Nikita’s is the Freedom Bar, which is fundamentally a sports bar with occasional live music. The Freedom Bar is always an interesting night out, especially if you enjoy a vibrant atmosphere. 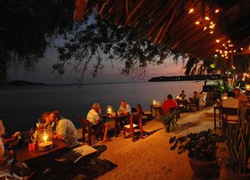 The beach road in Rawai is home to many small and inexpensive bars that make for a good night out. The bars are all so close together that you can hop from one to the other in super quick fashion. On Viset Road from Rawai Beach to Chalong, you will also find many small beer and girlie bars on both sides of the road. One of the bars is named Purple Haze, and although it might appear a little downtrodden to some, others will tell you it has character by the boatload. Purple Haze, as the name would suggest, is home to live rock bands every night of the week. The Laguna nightclub and Laguna Plaza are situated at the south of Phuket island in just 800 metres from the sea at Rawai beach. The Laguna Plaza Open 3 pm and The Laguna Nightclub door open midnight till dawn. 7 day per a week. Icon situated in Rawai on the road to Kata. It has a snazzy interior and features three DJ’s pumping tracks out of a booming system each night. This nightclub is usually packed during the weekend. At front is the friendly Iconic Bar that has a pool table, free WiFi and pub food from steak & kidney pies and Aussie pies to burgers.